Built as beacons to guide sailors to safe harbor, the allure of lighthouses still draws us in. Even though lighthouses were primarily intended to show sailors what to avoid, we now seem to be drawn to them. Dozens of these graceful structures remain in Maryland. Begin your lighthouse tour with these beautiful historic beacons and enjoy the surrounding nature and vistas of the Chesapeake region. Not only can you tour this lighthouse, but you can also rent one of the two renovated rental units in the keeper’s quarters that include all the modern amenities and beach access. Stay at this unique historic lighthouse and spend your day playing on the bay. Visitors to the Calvert Marine Museum can climb inside this 46-foot-tall structure and and see the preserved innkeeper’s quarters. The museum also offers boat tours of neighboring lighthouses. This is a replica of a historic lighthouse located in Cambridge, that once guided mariners along the Choptank River. The lighthouse features a mini-museum and visitor information. From May-October, the lighthouse is open daily, 9am-6pm. for free self-guided tours. Volunteers serving as “lighthouse keepers” will be on duty Fridays, Saturdays, and Sundays to answer any questions. 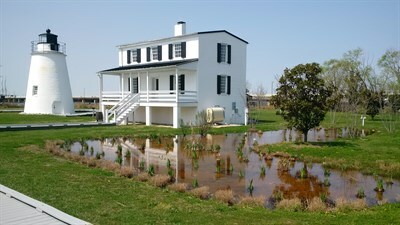 In the off season (November-April), the lighthouse is open by appointment (call 410-463-2653). This 1870 lighthouse is on the grounds of Fort Washington Park outside Washington, D.C., and is still used as a navigational aid today. 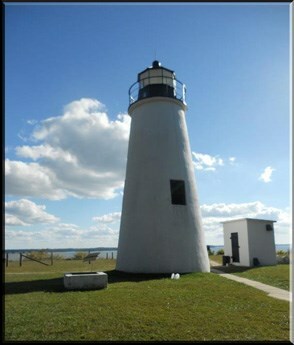 Visit the historic lighthouse and fort, then enjoy a picnic or a day fishing. A National Register historic site, this Havre de Grace beacon is made of Port Deposit granite has withstood the tests of time, and is the oldest lighthouse in Maryland still open for public visits. Originally built in 1879, today this lighthouse is located on the grounds of the Chesapeake Bay Maritime Museum in St. Michaels. Visitors can climb inside the hands-on exhibits or participate in the museum’s Lighthouse Overnight Program, which allows guests to live the life of a lighthouse keeper. The oldest on the Potomac River, climb this 1836 lighthouse for great panoramic views, then walk along the beach or bring your kayak for a day on the water. The lighthouse sits atop a 100-foot bluff and offers stunning views of the crown of the Chesapeake Bay. Still an active navigation beacon, Turkey Point is in beautiful Elk Neck State Park. The last of the classic Chesapeake screwpile lighthouses still in its original location, Thomas Point Shoal Lighthouse is perhaps the most recognizable and beloved landmarks on the bay. Accessible only by boat and staffed by volunteer docents, Thomas Point is on the National Register Historic Places. Located in the heart of Baltimore’s Inner Harbor, this lighthouse is part of Historic Ships in Baltimore. Fascinating exhibits provide a great window into history.